Belinda teaches Indigenous Studies and Cree language in Saskatchewan. 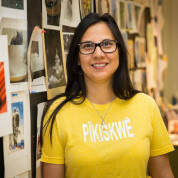 She believes in the strong connection between language and identity, and seeks to create pride and self-esteem in her Cree students by teaching their history, traditional knowledge of the land, and proficiency in their language and texts. When covering social injustice suffered by Aboriginal people, she creates links to the issues that her immigrant students have encountered due to colonialism and racism in their countries of origin. Belinda has established a successful summer camp that has been running for 11 years, the Nehiyawak summer language workshop. She has also been on local television in Saskatchewan and created ‘How to speak Cree’ TV segments. She was involved in developing a high school curriculum for Core Cree with the Ministry of Education for Saskatchewan, and initiated and led a bilingual Cree elementary program. She lectures at Canadian universities and has shared her insights from educating Indigenous students in several publications. At every stage Belinda has taken care to integrate language learning with an Indigenous worldview. Join the #TeachersMatter movement by sharing Belinda Daniels’ update.